Virtualization of the data center has proven to be a true IT game-changer, providing increased flexibility and control in managing production workloads, as well as, making disaster recovery easier by representing everything in logical terms and doing away with the need for a physical replica of your environment. 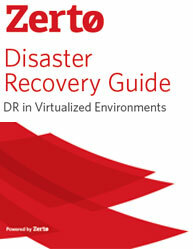 This whitepaper on “Disaster Recovery Guide-DR in Virtualized Environments”- Provides insights in the challenges, needs, strategies, and available solutions for disaster recovery and business continuity, especially in modern, virtualized environments and the public cloud Explains the benefits and efficiencies Virtual Replication delivers and how it compares to other BC/DR technologies Provides businesses with the right information to choose the best possible BC/DR solution for their situation You've already realized the benefits of server virtualization but have you extended that to your Business Continuity/Disaster Recovery plan? There can be number of reasons why Business Continuity Plan fails .Sometimes it is a combination of issues. 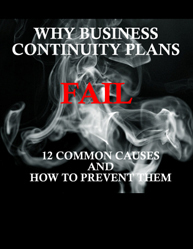 So what are the common reasons stopping your business continuity plan from succeeding? As organizations are failing to implement the real-time business continuity plans, they need help in finding the reasons for the failure and being certain that it does not recur. This whitepaper includes the top 12 reasons as to why business continuity plan fails, evaluate them against your current plans and make adjustments accordingly and prevent your business continuity plan from failure. It addresses a few questions like: What is the subset of disaster recovery planning? How to prevent derailing your business continuity plans from communication issues? What top enterprises are doing to get benefit from business continuity plans and avoid its failure? What are the actions you can take to prevent the causes of business continuity plans failure?